With its rugged peaks, forested plains and lush valleys carpeted with wildflowers, the Stirling Range National Park has no shortage of impressive scenery. 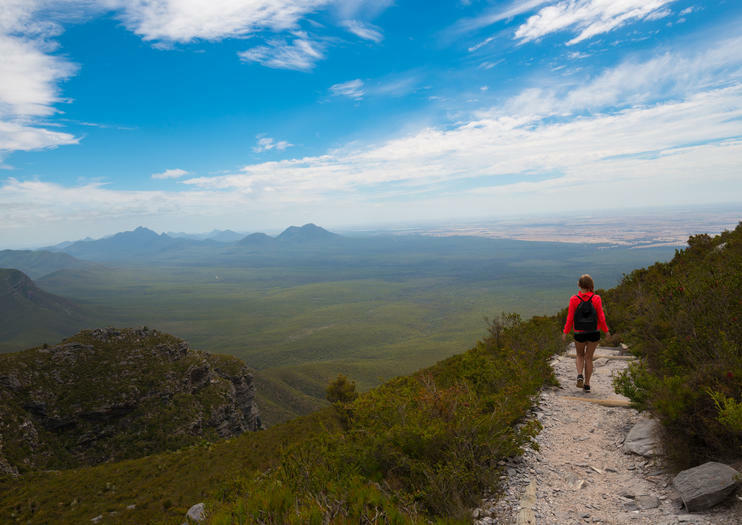 A popular choice for hikers and climbers, the park is home to some of Western Australia’s highest peaks, with the Stirling Range stretching for some 65km and harboring a vast network of marked walking trails. Gum Spring, Bluff Knoll and White Gum Flat. Wildlife enthusiasts will also find plenty to get excited about, with opportunities to spot kangaroos, wallabies and emus, plus an incredible variety of birds, including rare sightings like short-billed black cockatoos, western whipbirds and purple-gaped honeyeaters. During the summer months (October-December), the mountain valleys are also renowned for their magnificent array of wildflowers. Over 1,000 varieties of banksias, mountain bells and orchids bloom throughout the park, many of which can’t be found anywhere else in the world. Stirling Range National Park is located around 300km southeast of Perth in western Australia. Experience highlights of Western Australia’s scenic south on this diverse 4-day tour from Perth. Sample local flavors and watch a sheep-shearing demo in Margaret River, cruise around the Nornalup Inlet and see where the Indian and Southern oceans converge at the Cape Leeuwin Lighthouse. Discover the area’s natural attractions as you marvel at the vast Mammoth Cave and climb above the treetops in the Valley of the Giants. Rest easy with three nights of included accommodation. Explore the unspoiled southwest corner of Australia on a 6-day guided camping tour from Perth. You’ll see natural wonders like Wave Rock and the Margaret River caves, walk among the treetops at Valley of the Giants, go swimming in Cape Le Grand National Park, and take a hike in the Stirling Ranges. Five nights of camping accommodation are included, as are all meals. This tour is limited to 18 people.